consistent with the low level during fall 2012.
before the prediction time of 12/21/2012 at 0100 utc. with saturn from the sun's perspective. 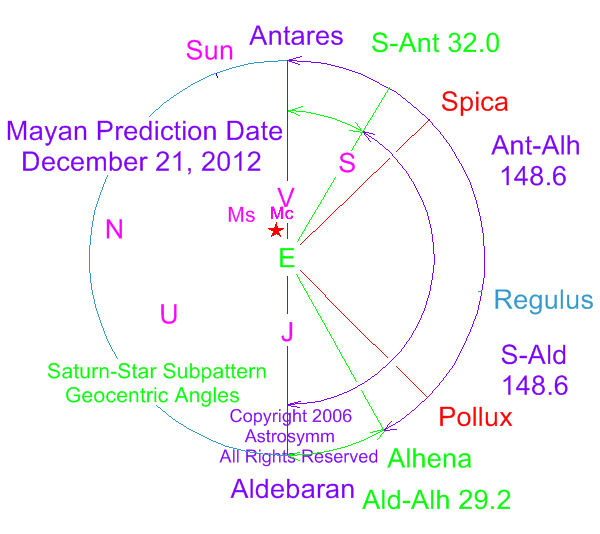 in this heliocentric, or sun-centered view of the 2012 mayan date, a four-axis tetrad, or group of four, is apparent. this tetrad is composed of the following elements: 1) uranus, 2) aldebaran-jupiter-antares, 3) neptune-regulus and 4) venus-saturn. watch for intense solar flares around this date. please access the solar system page to view oct 2, 2012 solar plasma event. one basic cycle of the long count calendar is 13 b'aktuns. one b'aktun is 144,000 days. so 13 x 144,000 is 1,872,000 days or 5125.26 years. now it turns out that saturn and uranus repeat cycles at 5125.44 years. this means that saturn and uranus were at the same point in the sky - within 1.08 degrees- relative to the sun - 5125.44 years before dec 21, 2012 or about oct 15, 3114 bc. this is within 2 months of the widely-accepted aug 11 date for the beginning of this cycle! since their positions were repeated, the symmetric pattern with aldebaran/antares and regulus was also in place at that time. please reference the mayan prediction date diagram immediately above. it's important to remember the diagram is heliocentric or sun-centered. the diagram shows objects in the sun-earth plane, also know as the ecliptic plane. please note that through the fall of 2012 the saturn-regulus angle slightly increases while the uranus-aldebaran angle slightly decreases. 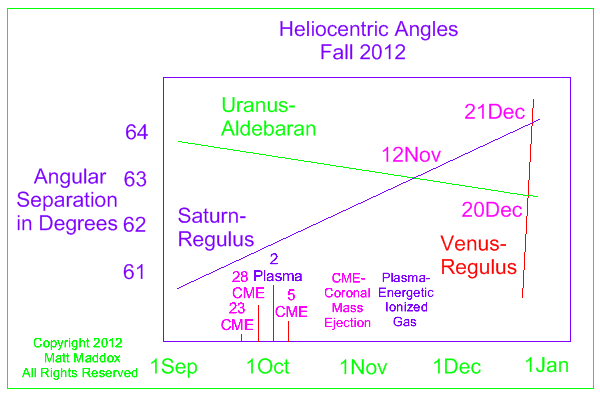 the two angles match values on about november 12. on this day, coincidentally, venus lines up with regulus. venus continues it journey around the sun and approaches saturn. 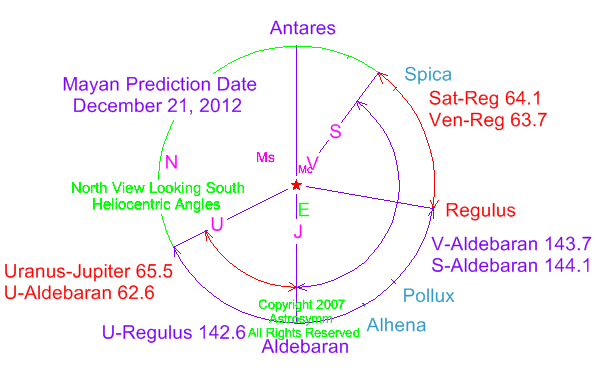 on december 20 the venus-regulus angle matches the uranus-aldebaran value. then on december 21 venus lines up with saturn from the solar perspective. the venus/saturn-regulus angle is still very similiar in value to that of uranus-aldebaran. there should be marked solar activity 3-4 days before and 3-4 days after december 21. some of this will be geoeffective. the mayan prediction date is december 21, 2012. from earth's perspective, this date shows that both venus and jupiter are lined up along the antares-aldebaran axis. at the same time, saturn will be in a position which completes a "double k" pattern. during the 1982 eruption of el chichon in mexico, jupiter was in a similiar position. this pattern should generate large volcanic eruptions and earthquakes.